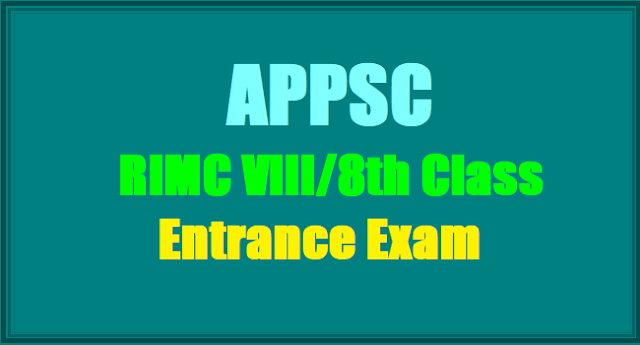 APPSC RIMC Dehradun VIII/8th Class Entrance Exam 2019 Notification/Rashtriya India Military College/RIMC Applications/Rashtriya Indian Military College Entrance Exam/ Rashtriya Indian Military College Admission 2019: Rashtriya Indian Military College has issued Notification for the Entrance Examination June 2019 for admission to VIII Class in the R.I.M.C. Dehradun for the Term January, 2019. The Examination will be held on 01/06/2019 and 02/06/2019 at Vijayawada. Only Boys are eligible to apply to the RIMC. At the time of admission to RIMC (i.e. on 01/01/2020) the boy should either be studying in Class VII or should have passed Class VII from any recognized School exclusively for the state of Andhra Pradesh consists of 13 Districts only. They should not be less than 11 1/2 years in age but should not have attained the age of 13 years as on 01/01/2020 i.e., they should not be born earlier than 02/07/2007 and not later than 01/01/2008. Exam Date: Only Boys are eligible to apply to the RIMC and the dates of examination are 01/06/2019 and 02/06/2019 at Vijayawada only. Eligibility: The children from the Andhra Pradesh state are only eligible to apply (13 Districts only). The prospectus along with application and previous question papers can be procured directly from Commandant, RIMC, Dehradun,-248003, on payment of Rs.430 (for Registered Post) or 480(for Speed Post) for General candidates and Rs 385 (for Registered Post) or Rs.435 /- (for Speed Post) for SC/ST candidates along with caste certificate through Demand Draft obtained in favour of The Commandant, RIMC, Dehradun payable at State Bank of India, Tel Bhavan Branch, (Code No.01576) Dehradun, Uttarakhand. 25 Cm. duly affixing postal stamps worth of Rs.100/-(Rupees One Hundred only) along with Demand Draft and send the requisition on or before 31/03/2019. Filled in application forms along with necessary certificates in duplicate should be sent to the Assistant Secretary (Exams), AP. Public Service Commission, Prathibha Bhavan, Beside Gandhi Bhavan, Nampally, Hyderabad -500 103. While submitting the application, the following documents should be enclosed along with application. 1. Two Copies of Original Application obtained from RIMC or from O/o. APPSC., Hyderabad.